Montgomery’s Inn, Toronto, ON. Photo by loreth_ni_Balor. Tom Peace recently published a post on Active History calling attention to the emergence of another round of the History Wars, but the more pressing forthcoming history war may be one between the historical community and the politics of austerity. Budget cuts at the municipal, provincial, and federal levels of government across the country have targeted cultural and heritage institutions, threatening the integrity of the capacity of Canada to maintain an adequate understanding of its collective past. Similarly, mayoral candidate, Rob Ford, told Toronto voters there was ample “gravy” to be eliminated from the city budget without clearly defining his meaning of “gravy”. In fact, it was that simple message with no details that probably won over Toronto voters in 2010. It is clear now that some of the primary targets of government austerity measures in Canada are cultural and heritage institutions, including libraries, archives, and museums. Just as Margaret Atwood helped mobilize opposition to proposed cuts to Toronto libraries, the challenge for active historians who oppose such measures is to make their opposition public. The Canadian Association of University Teachers has taken a leadership role with its opposition to the cuts to Library and Archives Canada through an information and petition campaign called “Save Library and Archives Canada”. The federal government’s “modernization” program for LAC has led to a series of substantial service cuts that have undermined its ability to acquire and preserve a diverse collection of artistic, cultural, and historical materials relating to Canada’s past. Readers who oppose such cuts should lend their names to the petition here. At the municipal level in Toronto, Councillor Joe Mihevc has revealed that closed-door budget planning proposes to shutter four Toronto museums, including the Market Gallery, Gibson House, Montgomery’s Inn and Zion Schoolhouse. The historical community, once again, is trying to clearly voice its opposition through an information and petition campaign. Again, readers can sign the petition to stop these cuts here. Canadian historians from Toronto’s universities have also written an open letter [PDF] to city council opposing the museum closures. As a proportion of the budgets of the federal government and the City of Toronto, cultural and heritage institutions are insubstantial. 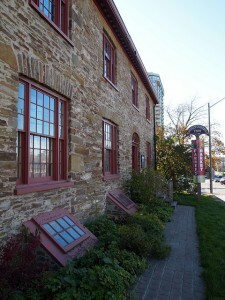 For example, the proposed closure of the four museums in Toronto is projected to save about $1 million, according to a Toronto Star report. This constitutes just a fraction of the city’s $9.2 billion 2010 budget. In 2010, the federal government spent $124.5 million on the operation of Library and Archives Canada. This constituted 3.5% of all spending by Canadian Heritage that year. To put this in further perspective, the cost of LAC in 2010 was just 0.06% of the total ministerial net expenditures of about $225 billion. If the proportional cost of cultural and heritage institutions is so low relative to total budget expenses, one can assume then that cuts to these services are ideologically motivated. These services have been targeted for cutbacks not because they constitute substantial expenses for government, but because these governments do not see cultural and historical preservation as a significant public responsibility. If readers disagree with these governments and believe that libraries, museums, and archives are valuable public institutions, signing these petitions will begin to let it be known. Conservative Party of Canada. Here for Canada: Stephen Harper’s Low-Tax Plan for Jobs and Economic Growth, 2011, pg. 23. For details on 2010 federal government spending, see Government of Canada, Public Accounts of Canada 2010, Volume II: Details of Expenses and Revenues, Ottawa: 2010. Great post Sean. I wonder how many other communities are facing similar cuts across Canada (and beyond)? I also wonder how long until these same cuts really start to negatively transform history education and research in universities in Canada. The Republican Governor of Florida recently suggested the government should not pay for educations in fields like Anthropology. This was not a big surprise, but I was a lot more disappointed when Slate’s editor David Plotz agreed with this perspective on their political podcast a few weeks ago. While his fellow podcast hosts, David Dickerson and Emily Bazelon, made strong arguments against his perspective, it still suggests that some centrist liberals in the USA are starting to question the value of state support for educations in the social sciences and humanities. How do we counter this trend? I also found this post really interesting. Furthermore, Jim raises a very interesting question. If individuals on the front line occasionally grapple with these nuts and bolts, I can imagine administrators, politicians, and commentators having difficult articulating these issues as well. This is not to say that we need to have a rote curriculum, as part of the joy and real contribution that the humanities can offer our students comes from exploring, pushing boundaries, etc. That said, I think at the base level we need to think about why history matters, what value we offer, what our students get out of our programs, and use that as a powerful statement. Are we preparing students for academic careers? The knowledge economy? What can a second-year history student expect to learn? I’m just thinking out loud here. Thanks for the feedback on this post. As a short response, I think one of the challenges facing history educators and public historians is just what Ian points out, the need for a clear articulation of purpose and contribution. The problem, however, is not that public historians and history educators cannot form such a message of purpose and contribution, but that the terms of the politics of austerity are limited to economic contribution. There seems to be very little room in the present political discourse to discuss social contribution or citizenship values associated with museums and institutes of higher learning.